This is both a fascinating and slightly boring topic. Boring because it is probably one of the most often cited features of Gaelic. Fascinating because ... well, you'll see. Aspiration is the puffing sound heard, for example, in English, after p, t, c, when those letters are at the beginning of words. Pre-aspiration is a feature that arises in certain languages that insert aspiration before such sounds when they occur in the middle or at the end of a word. This is where the weird stuff begins - but here are a few basic rules for what to do when. Most Scottish Gaelic dialects have pre-aspiration, these days, so if you're learning Gaelic, you should pre-aspirate. The majority of speakers have moderate pre-aspiration. Although most speakers insert [ʰ] or [h], very few insert [x] throughout. Pre-aspiration never occurs word initially, it's strongest in the second syllable, and weakest in subsequent syllables - although there are not many instances of subsequent syllables. Also, pre-aspiration is weaker after long vowels. Pre-aspiration adjusts for broad or slender vowels. Before a broad vowel it's [h], but before a slender vowel this changes to [ç] - as seen in chì [çiː], only less prominent. For convenience sake, it's usually just transcribed as [ʰ]. So what are the weird bits? Well, pre-aspiration is rare among the languages of the world and it's most frequent around the Arctic Circle. Another weird bit is that pre-aspiration is "staggered". That means that [xg] is the sound most likely to be pre-aspirated and most strongly aspirated. And also, if pre-aspiration occurs before [hd] it must always occur before [hb]. 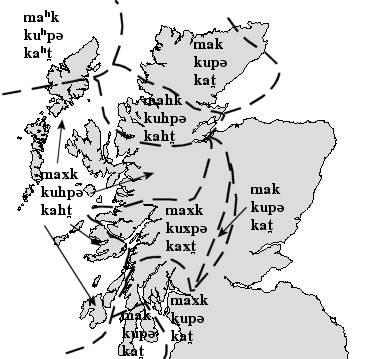 Look at the map above and have a look at pre-aspiration in Bute, Cowal & North Kintyre to see [maxk] [kupə] and [kat]. Incidentally, there are/were some dialects which did not have pre-aspiration. Look at the map again to see that the Gaelic of East Perthshire and Kintyre & Arran did not have pre-aspiration, at all. This is something interesting to listen for should you meet a speaker from one of these areas. But that last bit needn't worry you as a learner or speaker of Gaelic as long as you know what to do when. Air a tharraing à "http://akerbeltz.org/index.php?title=Pre-aspiration_or_What_the_h_in_mac_is_about&oldid=2430"
Chaidh an duilleag seo a dheasachadh 16 dhen Dàmhair 2013 aig 09:00 turas mu dheireadh.